Marie J was built in Whangarei by Master-Craft ( M Ryan) in 1956 & measures 30′. Built of kauri & presently owned (for approx 5 years) by Peter Croft & kept at Gulf Harbour. Peter C. bought her off a Mr Hambrook of Auckland, who bought her in Motueka (2005) & cruised her to Onehunga, Auckland, via the West Coast. Then a quick road trip over to the Waitemata Harbour. Her history at Motueka & before that, is unknown. She has been powered by a 4 cyl 90 hp Ford diesel since new & due to some very bad luck has had a total of 3 of these engines, including one installed this week by Moon Engines. For the record – it’s a 1948, 38′ Lidgard named Hirawanu. 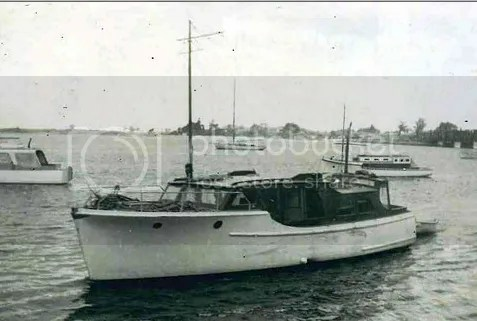 This entry was posted in 1940's, 1950's, 28'>30', 36'>38', A Peek Down Below, For Sale, Launches, Non Waitemata and tagged Hirawanu, Lidgard, Marie J, Master-Craft by Alan Houghton - waitematawoodys.com founder. Bookmark the permalink. Hi all, I was just researching my grandfathers old boat “Hirawanu” as I don’t have any photos and found this thread. George Nesbit Dods was the owner before it sat unused for many years. I can probably get more info from my dad if anyone needs it. Get in touch. Bringing her back up to Auckland she will be lying at Island Bay in beachhaven..
Bluestreak, shes of course far from original, but not may are! would i be able to advertise here here? Photos below that KR mentions. Well, we do, at last, seem to be getting somewhere with the ALMARAY/RUTH name saga. The below I have now received from Brian Worthington, helps to fill in the gaps I think. I have also sent to Alan images ex Brian W, of her as RUTH, & it now seems pretty certain, that she was ALAMARAY until somewhere around 1960 & probably changed to RUTH, by Jack Stevens, who has now passed away. The images confirm she is the same boat. This is all becoming a bit weird. ALMARAY was built by Lidgards in 1946 for Stan Bell-Booth but didn’t have a Lister. Her first engine was a Chrysler, changed to a Kermath in 1949. She was ALMARAY until at least 1957. Let’s see what Brian comes up with. Whatever the answers, Ken needs to treat his childhood memories with greater caution. HIRAWANU is owned by Mark Picard who bought her off his late father in law, a few months ago, & he had had her for a few years, & before that she sat on a mooring at Tauranga, & was hardly used for many years. You’ve lost me completely, Ken. I have always known from my childhood days when they were all new,that one was ALMARAY as I knew her by site when new, the second was MONTEREY, I photographed in 1948, & the 3rd I could not remember the name of, but saw an image of what looked like her, on Brian Worthington’s site, & he told me she was RUTH, & had been as long as he had known her, which at the time, did not ring a bell at all to me, as her name, as I had thought she had had a Maori name, which I couldn’t recall, so accepted RUTH, on his input, & her being the 3rd boat. However in the light of your input today from Harold re HIRAWANU, plus my recall on her having a Maori name, & her history as it is, there can be no doubt she is the 3rd of the 3 boats, & RUTH must be from another date & time. Am glad at last to have this sorted out in my mind, as have never really felt comfortable about RUTH — it didn’t fit my limited recall at all. I had made reference to all 3 boats, & my being unsure of the name of the 3rd one but it was almost certainly Maori, in previous early posts– KEN R.
I guess that’s possible. However both both launches are listed as having different owners and different radio call signs in 1952. HIRAWANU was HIRAWANU in 1946. No doubt she’s a Lidgard, but why do you need her to be either ALMARAY or RUTH?? So she is not a Shipbuilders design? At Milford, the Commodore’s boat Timepiece has the same hull, with that round-to-hard chine hull shape and convex stepped sheer. Thought it was Shipbuilders. PS the Ryan brothers were excellent tradesmen and yachtsmen in Whangarei. They built the very pretty E Class yacht WAKANUI which my father owned 1936-9. I have just directly compared the images simultaneously on screen, of the trade me image, & one I took of MONTEREY in 1948, & there is no doubt she is one of the 3 boats — she even still has the original little bronze casting at the top of the stem, that they had.. I saw MARIE J in Motueka in 2002 and spoke to her owner Ian McLean who bought her in 1989.He told me she was built by Ryan as stated above and then had a 4 cyl Ford diesel. He said she was originally built for gamefishing and was one of several of this type built by Ryan. HIRAWANU’s first owner (1946) was C.T. 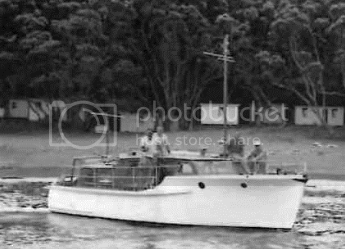 Jonas who had Lidgards build the A Class keeler HINEMOA in 1948. He owned several other yachts including LANDFALL, the Lidgard MATATUA and CAROLYN. HIRAWANU’s original power was a 30hp Lister. M Matos owned her by 1952. Computer screen critics are best known as “Captain calm waters”. Weetamo! Give her a chance. Dissect off (i.e. chainsaw off) the parts that don’t work and look at that hull and focus on that stem. Recognise the style? Check out Ngaro for example. Just a mismatch between hull and upper works -not uncommon. She’d be one of the stylee little ’50s bridgedeckers or sedan tops with some effort. No No, sorry but what a ugly looking craft on water. HIRAWANU almost looks like a sister ship to ALMARAY MONTEREY & RUTH, the 3 identical boats we know about, that were all built at the same time, in the Roy Lidgard Auckland shed, c1946-47, (refer image in shed on post of 6.8.15 of MAHARATIA). Hopefully we will get more info. Actually the bow & flare look absolutely identical, & I think it may well be a rename, & coamings modification, to RUTH OR ALMARAY. Lidgards would never have built coamings just like that, & there is no doubt in my mind, they have been partially at least, redone, since her original days, whatever they were like.